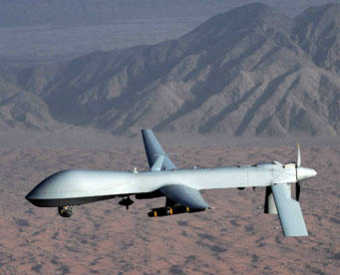 Kabul, Afghanistan – The Defense Department announced Friday that one of its many Predator drones will take over command of U.S. forces in Afghanistan, effective immediately. The drone, or unmanned aerial vehicle (UVA), replaces General Stanley A. McChrystal, who had been in charge of U.S. and Nato forces in Afghanistan since June of 2009. Gen. McChrystal could not be reached for comment. Pentagon Spokesman Geoff Morrell explained the thinking behind Friday’s decision, saying that Defense Secretary Robert Gates had not lost confidence in General McChrystal; he had gained confidence in the unmanned drones. Morrell said the particular Predator drone chosen to lead the U.S. forces would not be appearing before the press or answering any questions about possible changes in war strategy. Praising the career and service of General McChrystal, Morrell said the decision was a difficult one for Secretary Gates to make, but that he had the full support of the Pentagon leadership.